What Were You Doing at 25? Take a look back and think about what you were doing when you were 25 years old. Maybe you were just getting out of college and starting a new job. Perhaps you had been married for a few years and starting your family. Or maybe it was a combination of the two. Whether it was a long time ago or just yesterday, most of us had big plans, hopes and dreams at 25 years old. You feel as if the entire world is at your fingertips and you can accomplish anything. Well, that’s the way we feel at Pure Romance today. Because this year, 2018, is our 25th doing businesses with our amazing Consultants across the globe. It’s a good time to reflect on what we’ve accomplished in 25 years, and to look ahead. Just like many of you, 25 years ago I had dreams of providing for my family while being able to empower, educate, and entertain women. From those dreams Pure Romance was born and I was able to fulfil my dream of caring for my kids, setting my own hours and helping other women make their own dreams come true. And now, here we are 25 years later and almost 30,000 women across the world are able to own and operate their own business, provide for their families and live life by design. That’s quite a lot to celebrate and we plan on celebrating quite a lot during this 25th anniversary year! You’ll hear more details about our 25th anniversary plans as the year goes on and especially at our World Conference. For now, join us as we begin our 25th year of Pure Romance. Hey, we feel we’re just getting started! 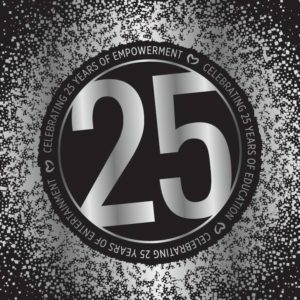 Be part of a celebration 25 years in the making! 2 Responses to "What Were You Doing at 25?" I’m so blessed that Pure Romance came into my life nearly 9 years ago when I said yes to the business opportunity. The changes it has made in my family’s & my lives is immeasurable. Thank you for fighting so hard to make your dream a reality for us all Patty!